Happy Australia Day! Now I’m going to do the Australian thing and talk about real estate. Later this year it will be ten years since I moved into this house. It’s got me pondering maintenance, repairs and a little bit of renovation. Window repairs. 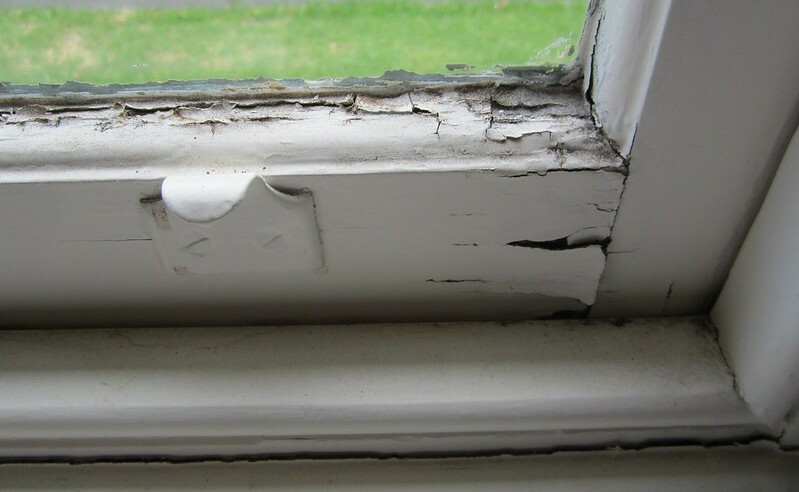 Some of the wooden windows need patching up as they’re showing signs of water damage. It’ll be good to get this done before it gets worse and more expensive to fix. Some of the sash windows need additional repairs, and the same guy can look at a couple of other issues including cracking brickwork. This lead me into house painting. The windows obviously need to be repainted when patched. Looking at the rest of the outside of the house, it seemed like it might be a logical time to get it all done in one hit — for one thing where the windows were repainted, they’d match everything else. Thirdly, external blinds. This is part of my three-point plan to keep the house cool on hot days via passive cooling. 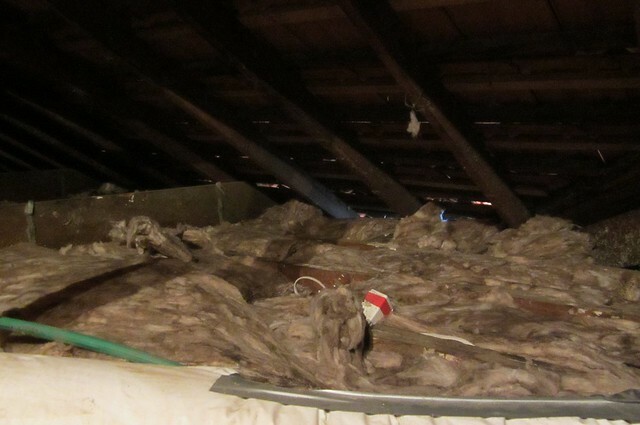 The first two parts were better roof insulation, and ceiling fans. I’ve ordered three external blinds for the biggest north and west-facing windows. Wait, do ceiling fans count as passive cooling? Not sure, but hopefully the external blinds will make a difference, by deflecting the heat before it gets into the house. At present the inside of the house can get up to the low-30s on a really hot day. I’d heard mixed reports from the big blind company starting with V (who also own the one starting with K), and ended up with the one with the appalling radio jingle starting with B. They came out on Monday and the bloke seemed cheerful and knowledgeable. I also got him to quote on replacing a broken interior window blind. I’m not sure I understand their system of working out a price then automatically giving you a 40% “factory discount”. If that’s done as routine, it’s not really a discount — it’s just your price. I gather V/K do something similar, but press you to agree on the day to get some/all of that discount. Must be something they just do in the blinds business. As part of preparations, I spent some time in the garden with various implements of destruction clearing away bushes from the walls and windows to about a metre. Hopefully it’s enough to allow the coming small army of tradespeople to do their work. I’m also steeling myself for the cost. Suddenly I find myself up for about $800 of window repairs, $2000 in new blinds, and a third big bill for painting, which will drain away my savings somewhat. But it ultimately is an investment in keeping the house shipshape, and cooler in hot weather. And doing a bunch of repairs and renovations at the start of the year is good, because (as will be the subject of a future blog post), I always get a whole raft of annual bills midyear. Wednesday: Window repairs done, went smoothly, apart from one crack in a pane, which was then repaired. Now awaiting painter. Friday: Painter came yesterday to get paint samples, and today used a high-pressure hose to wash down the house, and did some other preparatory work. Painting itself starts tomorrow. So, how did my old wooden house cope with the heat? It’s not brilliant, but it’s also not unbearable. 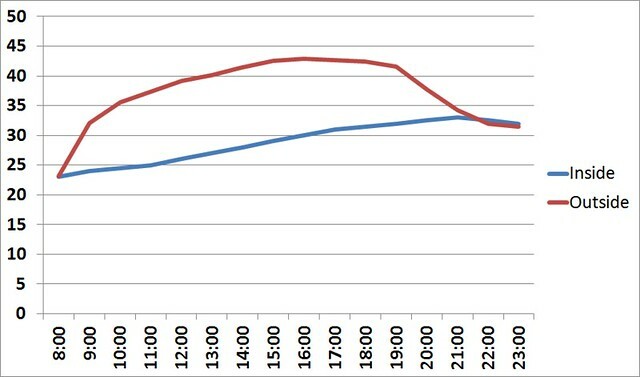 I was at home most of Tuesday, and graphed the temperature rise. Inside temperature from the thermostat / Outside from the BOM Moorabbin Airport readings. Unlike last time (2010), the overnight temperature had been a lot warmer, and thanks to this being just day one of a four-day heatwave, in the evening it didn’t drop off allowing the house to cool down. The roof insulation that we have now made a little bit of a difference I think, but undoubtedly we saw the inside temperature slowly rise across the day. Better window protection is what’s really need to fight off the heat coming in, I suspect. The additional fans we have make a real difference to comfort levels, even if they don’t seem to affect the temperature reported by the thermostat. 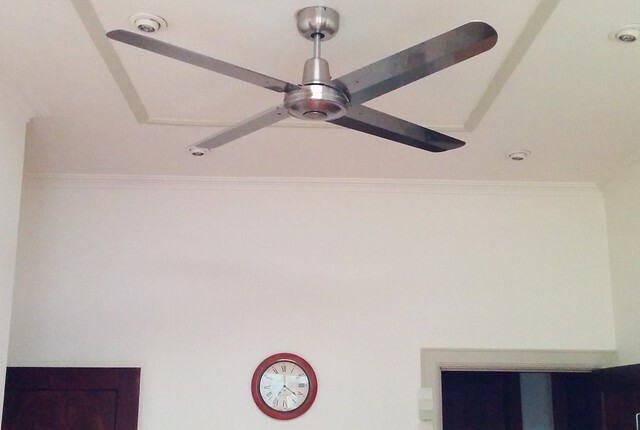 Ceiling fans in two main rooms (plus a third in one of the bedrooms) plus portable fans help make it bearable. Overnight Wednesday/Thursday the outside temperature dropped a bit more — down as low as 24 at midnight — allowing us to cool the house just a little from outside. As I write this, the thermostat reports 28 degrees. But to really cool the house will have to wait for the cool change on Friday afternoon. And, in time, I’ll keep considering further house upgrades such as external blinds, window glazing, wall insulation, and the dreaded evaporative cooling and/or air-conditioning. — Stuff like this makes me ponder that it’s a little unfair that some areas likely to see power cuts caused by the stress put on by those with juice-hungry air-con, but which affects everybody — whether or not they have air-con, and whether or not they are offsetting their grid usage with solar. Surely in the age of smart meters, they could limit everybody to X kilowatts off the grid? I’ve got a new ceiling fan in the kitchen. 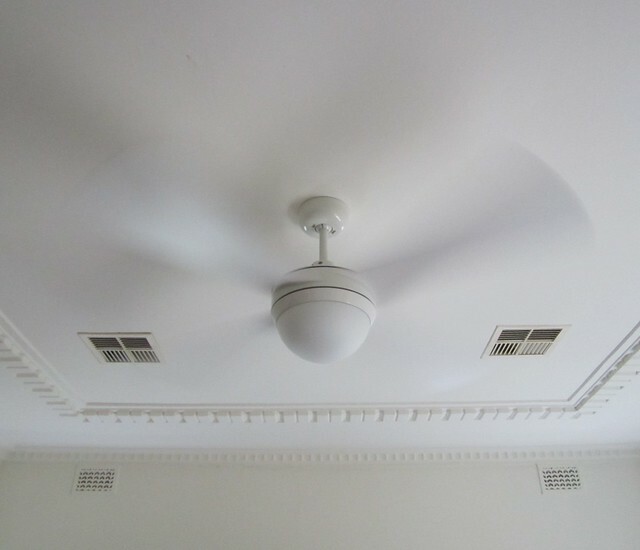 The bloke at the lighting shop said that in a kitchen, a metal fan is good because it can be easily cleaned — whereas in a bedroom, quieter wooden fans are more often used. He also reckoned for the size of the room, the larger 52 inch blades would work well. So here it is in all its glory. I’m still getting used to it being there up. Sometimes I catch it out of the corner of my eye and think it looks like a gigantic spider up on the ceiling. At full speed it certainly produces quite a breeze, and helps cool the room down a lot. Wish I’d got it done when I got the livingroom ceiling fan put in, but better late than never. Which brings us to the weather. Here’s the forecast. I’ve previously graphed how the temperature rises in the house, but that was before I had the good insulation put in the roof (might do an update this week). The insulation means the house doesn’t heat up very quickly… so a single hot day is usually quite manageable. The run of long days we’re expecting this week (worst since Black Saturday in 2009) will be a challenge though, as the house won’t get a good chance to cool down overnight. Having tried the ceiling fans (now in three rooms) on previous hot days, they do help, as do portable fans. But no doubt I’ll be pondering my stubborn refusal to get air-conditioning… though there are other less energy-hungry approaches, such as outside blinds over the windows, window treatments, and wall insulation. Last week I had a ceiling fan installed in the livingroom. It’ll help on hot days, and because I have ceiling ducted heating, also helps distribute heat better on cold days as well. 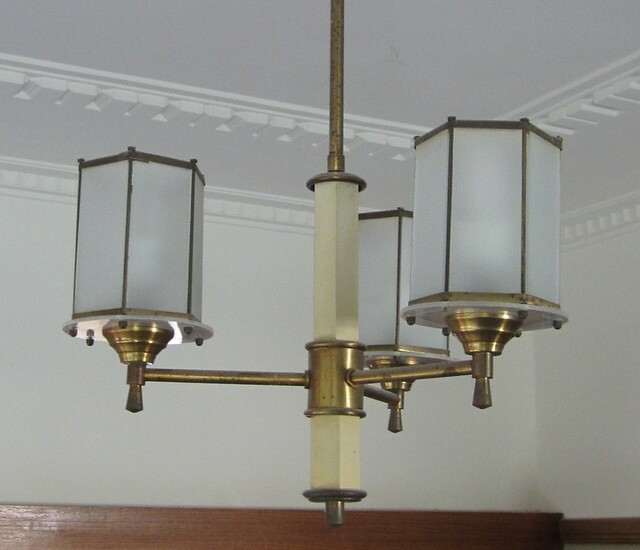 To do this, the old light fitting was removed. I’m hoping it might be worth something — I was never that keen on it, but it does appear to be an original, making it about eighty years old. There appears to be a reasonable market for such things. In contrast, I really like all the other (antique) lights in the house — except for the kitchen. Of course, now I’m realising that I should have arranged for the kitchen to have a ceiling fan installed as well. And while I was at it, I could have got them to install the heat guards for the down lights in there. They were switched from halogen to LEDs, so not as warm, but still worthwhile to assist with the insulation. Speaking of insulation, that got done yesterday morning. The old loose stuff had been removed last year. The very hot day or two last week was unbearable. Winter last year wasn’t much fun either. My estimate is that in a weatherboard house with no roof insulation, the temperature would drop by at least a degree per hour if it was cold outside, which made a big difference to the gas heating bill. So I finally got around to booking insulation back. This document from the Victorian Department of Sustainability reckons the recommended level of insulation for ceilings in Melbourne is R2.5, but I decided to go for R4. (Confusingly, I subsequently found this Federal government web page which recommends R4.1. Hmmm. The material they used was something called “earthwool” — which unlike conventional glasswool doesn’t cause irritation if handled without gloves. The installers appear to have done a good quick job, but it was a tad irritating that they’d booked in for 7:30am (necessitating everybody being awake and dressed early) but didn’t show until 10am. Not to worry; I think it’s already made a difference… after they’d finished, I turned the heat on (damn it was cold yesterday). Gaps were left around the down lights, with spare earthwool to fill in the gaps once I’ve had the electricians back in to install the heat guards. So, hopefully having insulation back in the roof will make a big difference, and it means the various housey things I’ve been meaning to get done are progressing. 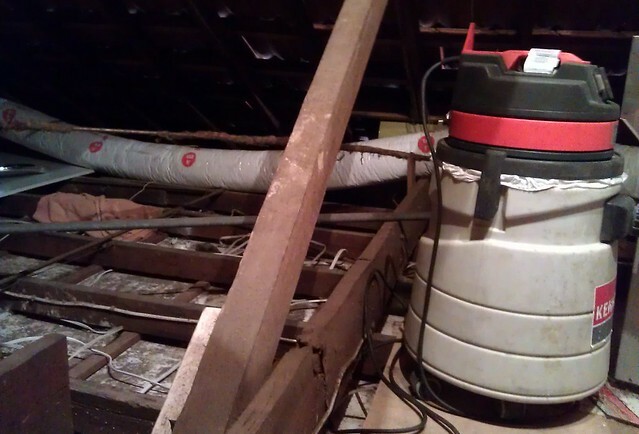 I spent about 4 hours in the roof on Sunday, with an industrial vacuum cleaner from Kennards, trying to clear out some of the residual insulation and other crap from up there. I had thought the half-day hire would be enough, but man, it’s hard work manoeuvring around up there, let alone with a big vacuum cleaner accompanying you. The placement of the heating ducts didn’t make it any easier, nor of course having to scrupulously step on the rafters, rather than putting my foot through the ceiling. Getting into some of the nooks and crannies was really difficult, particularly where the roof meets the ceiling. Nor making it easier was that the vacuum cleaner’s head didn’t seem to want to detach from the wand, somewhat limiting the flexibility of the unit. I spent much of the time just waving the hose around. It was quite exhausting, and by the time I had to take the cleaner back (it was $67 for a half-day, which in practice meant not just 4 hours, but 11:30 until 5pm; or $82 for a full 24 hours, but I wouldn’t have had the time or energy to do it) I reckon I would have done about half the roof. 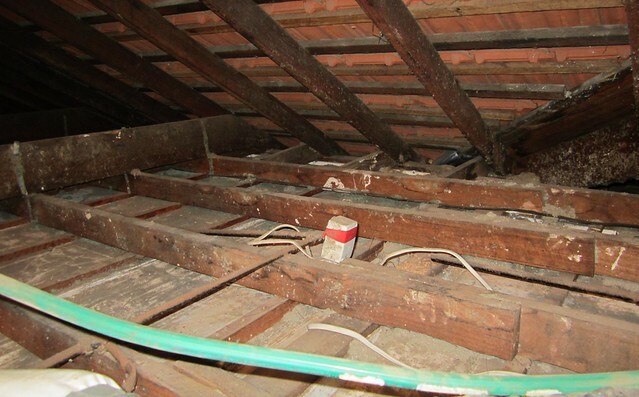 I had however concentrated on the worst (dustiest) sections, including the outsides of the ducts themselves. While up there I also removed any number of bits of junk that had been left behind by others over the years: numerous bits of wire, chunks of roof tile, and a 2 metre-long piece of pipe. There are a lot of other bits of disused pipe which will be somewhat harder to remove, and will require a plumber to be done properly. The idea is to make it easier for the new insulation to be installed. The carpenter guy I’ve been working with takes the view that the cleaner/tidier the area, the better the job achievable, which is probably fair enough. Given how knackered I was, hopefully it’s now clean enough. All the effort certainly had one outcome though: I’ve decided no way am I going to install the insulation myself. It’ll be well worth paying the pros to come in and do it properly, and avoid hours of frustrating, exhausting work. I’ve also learnt that scrabbling around in the roof space exercises muscles which don’t normally get used (and are still sore) and that I’m not very good at spelling vacuum.